Can Facial Exercises Really Prevent or Reduce Wrinkling Skin? Home » Can Facial Exercises Really Prevent or Reduce Wrinkling Skin? Does “exercising” your face—raising eyebrows up and down, rolling your head from side to side, puckering and un-puckering your lips 20 times in a row or just making random faces at yourself in the mirror every day—really prevent wrinkles from appearing on the face and neck area? Late-night infomercials featuring people who you have never heard of, tout the benefits of performing facial exercises and swear that if you do them faithfully, you will look 10 years younger. Even Dr. Oz has put his support behind the efficacy of facial exercises for preventing wrinkling and sagging. But what do professional dermatologists and cosmetic surgeons say about this dubious claim? Let’s start investigating the ability of exercising facial muscles to reduce wrinkling by stating that, as of today, no clinical research has been done to prove a positive correlation between wrinkle prevention and facial exercises. In fact, researchers would have to establish a longitudinal study involving at least 50 subjects to validate such a claim. In addition, long-term studies require something called a regression analysis that quantifies variables known to influence aging of the skin. These variables that would need factored out of the research study include smoking, diet, genetics and extent of sun exposure. In other words, comparing a smoker who regularly performs facial exercises to someone who does not smoke and also performs facial exercises will probably show that the person who does not smoke will have less wrinkled skin than the person who smokes. Does this mean that the non-smoker has benefited from facial exercises? Based on the statistical adage affirming “correlation does not imply causation”, of course it doesn’t! Moving on we come to the fact that excessive muscle activity is known to contribute to wrinkling and sagging of facial skin. People with noticeable crow’s feet are usually squinters and smilers while those who smoke or frown more than usual will inevitably experience deep wrinkling around the mouth. Think about a person who has suffered a serious stroke which left one side of their face paralyzed. Although it is unfortunate that this individual cannot move or feel this side of their face, isn’t it remarkable how smoother and unlined that side appears? This is because previously innervated muscles are no longer able to contract due to the stroke “freezing” them much in the same manner that Botox restricts movement of facial muscle. A neurotoxin that inhibits nerve signal transmission within muscles of the face, Botox is effective at erasing wrinkles because it interrupts contractions before they can affect muscles and induce wrinkling. Nor will facial exercises prevent skin from becoming fine, thin and dry, three common complaints of people over 50. Since scientists have yet to discover the biological mechanism behind the aging process, there is nothing we can do to prevent shrinking of fat deposits underneath our skin. In addition, simple wear and tear of the skin due to UV radiation, lifestyle choices and fluctuations in hormone levels attributed to menopause and andropause are entities responsible for skin aging that cannot be stopped but may be delayed. If you have ever seen a video of someone performing facial yoga exercises, it may initially remind you of a child making faces at another child. In fact, that is probably all facial yoga is good for—a laugh or two. Just like traditional facial exercises, facial yoga does nothing to improve wrinkles or tone sagging skin. One of these yoga exercises involves blowing up your cheeks repeatedly while keeping your lips together—like the way you held your breath as a child if you didn’t get your way. However, if you notice what happens to your face when you puff your cheeks out forcefully, it is apparent that forcing your muscles into this position creates mouth wrinkling and nasolabial folds to appear. Doing this over and over again contracts muscles into assuming this position, a condition that muscles quickly “learn” to adopt even when you are blowing your cheeks up like an angry toddler throwing a tantrum. The popularity of noninvasive, cosmetic dermatological procedures has skyrocketed in the past 20 years and Mayoral offers the latest techniques for eliminating wrinkles, sagging and deep folds that appear no matter what we do to avoid them. Dermal fillers such as Botox, Restylane and Juverderm take only a few minutes to inject into the skin and provides immediate results by plumping wrinkles and relaxing muscles so that they do not contract forcefully. Photodynamic therapy and Intense Pulsed Light therapy are also effective and painless procedures that smooth away wrinkles and rejuvenate skin tone and texture. 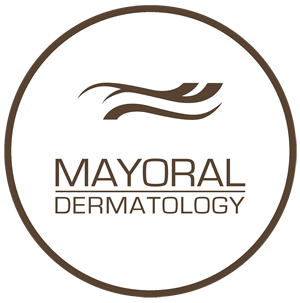 Mayoral Dermatology also offers dermabrasion, microdermabrasion and chemical peels are special kinds of exfoliation and deep cleaning treatments that rid the skin of accumulated layers of dead skin cells that contribute to wrinkling, blemishes and a sallow, dull skin tone. So leave the facial contortions to circus performers and call Mayoral Dermatology today to get that youthful, glowing skin you have always wanted quickly, painlessly and without the need for surgery.